A handmade Caerphilly with a distinct creamy outer layer near the rind and crumbly, citrus flavoured centre. Made with Organic milk. Caerphilly cheese originated in Wales because as a 'territorial' cheese, specific environmental conditions such as rainfall, humidity and mould types were beneficial to making this type of cheese. However, its manufacture almost died out until Todd Trethown re-established the production of the cheese in 1996, making it to a traditional recipe at Gorwydd, his family farm in the foothills of the Cambrian Mountains at Llanddewi Brefi, West Wales. Todd is originally from Somerset, like Chris Duckett, the third-generation veteran Caerphilly maker who worked withTodd to learn the trade, but had a Welsh grandmother who grew up just outside Caerphilly and used to make the cheese herself. As the dairy has become busier, the actual making of the cheese is now done by Todd's brother Maughan, and Maughan's wife Kim matures them. The Dairy moved to North Somerset summer 2014. 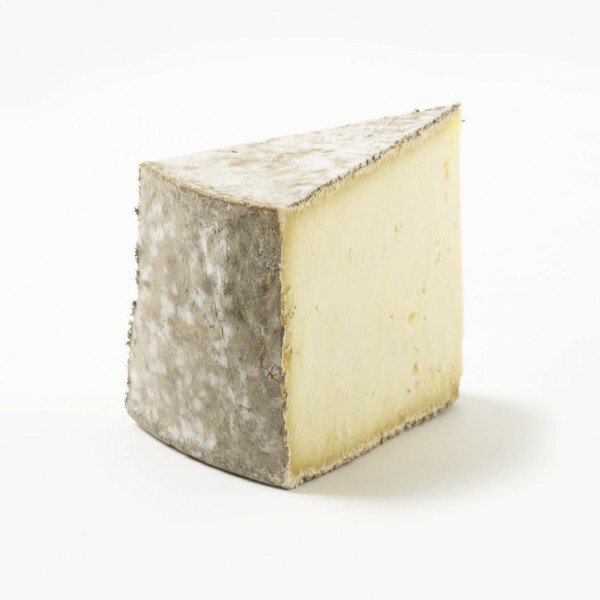 Gorwydd Caerphilly is a mature, hand-made Caerphilly made to a traditional recipe, using raw cows' milk and GM free animal rennet. These ingredients, combined with the process of working the curd by hand and encouraging the natural mould rind to develop, keep the cheese true to the origins of traditional Caerphilly. Caerphilly that may be bought from some supermarkets can often be thought of as dry and with little flavour. Gorwydd Caerphilly, however, is the opposite. It ripens slowly from the rind, giving it a unique, stripy interior with the crumbly centre being encased in a rich, softer textured paste. When the cheese is young it has a lemony fresh- tasting tang but as it matures this flavour changes to become more intense with an added creamy flavour letting the cheese become more dynamic. For a richer experience it is suggested for the rind to be eaten and enjoyed as well. Caerphilly was originally produced as something that miners might enjoy. The cheeses were rinded and shaped with a distinct depth, that enabled the miners to hold a wedge of the cheese with their dirty hands, and eat from the middle. Gorwydd Carephilly has won many awards; it won Best Territorial Cheese at 2017 Artisan Cheese Awards.